During his time in the NFL, Sam Gash accomplished more then most players. He was a 2 time All-Pro at the fullback position, and he won a Super Bowl with the Baltimore Ravens in 2001. 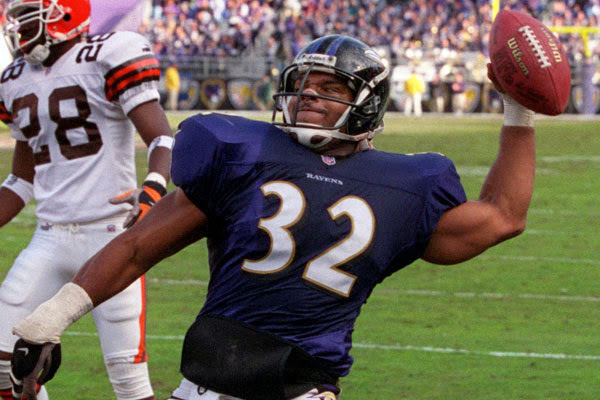 This Ravens team was known for having one of the toughest defenses of all-time, and this was a guy that went head to head with them every day in practice. Rather then go the conventional way with an interview and ask questions like "What was it like to win a Super Bowl?" I decided that it would be more interesting to get a former player's take on all of the controversies surrounding the NFL, and see if his insight would make things a little bit more clear for us. After talking with Sam, they certainly did. Brian Rzeppa: How prevalent is bullying in the NFL? Sam Gash: I wouldn’t say it’s bullying. Not every is ready to play in the NFL, whether it be physically, or mentally. There is a time that I’ve seen rookies quit. I hit a rookie in training camp, and we were doing the Oklahoma drill, and I hit a guy and he quit. I guess I messed his shoulder up. Now, is that bullying for me to go out there and make people quit on the field? It was my job to make people quit on the field, I was trying to get on the field. Off the field, it was a leadership issue, and it should have never gotten to that point. There’s no such thing as a club where people can use an N-word and be okay with it. That’s just not a word that I use ever. I think it’s derogatory and disrespectful. It’s going against everything we have fought for. I don’t think its okay for one black person to say to a black person, either. How big of a problem were concussions when you played? I think they were huge, but no one seemed to care. I used my head as part of my defense, and now people are missing weeks. There’s guys my age that are dying, and you think about it now, but when you were playing, you never thought about it. You played to keep your position. I tore my knee and tried to play, and if I didn’t I might’ve gotten cut. So the whole era of concussions in the league, I don’t really have a problem with it. There’s no one intentionally hitting anyone. You have to teach them when they’re coming up of how to hit. What do you think about the new rule changes? I think that there’s a big concern of football at every level, and that’s why everyone watches the NFL, because they’re making such a big deal out of it and what they do could impact college and high school football. I just tell them that everyone is not made to play football. Everyone is afraid of their kids playing football, but most of the time they’re going to be fine. But I think there just needs to be more awareness. Eventually you’re going to start seeing a lot of knee injuries, rather than head injuries. They need to be careful when they talk about lowering the target, because they’ll start popping up more. Special teams has become a real non-factor with these new rules, too. You might have games with one special teams play per game, and that’s become a huge rule change. It kind of takes one of the more exciting elements completely out of the game. One specific rule prevents running backs from lowering their heads and initiating contact, what are your thoughts on that one? I think that is a travesty, basically you’re going to start having guys who can’t lower their heads, and they’re going to get killed. I think that’s just the most ridiculous rule that I’ve ever heard. You need to be able to protect yourself. How did you deal when locker-room issues got out to the media? Well, you know, back then we were afraid to because those were grounds that got you cut. Now, with social media, things get said, when they wouldn’t in the past. If we were having a players only meeting, we weren’t going to announce it to the media. Every team that I was on, we also had leaders. With those people there, people didn’t want to bring it out. One scandal that rocked the football world last year was “Bounty-Gate.” Was there anything like this when you played? You hear about it, but to the extent of taking guys out and hurting them, no. We might have a bounty like make sure a linebacker doesn’t hit the quarterback, but I’ve never been a part of that. I played with one of the nastiness defenses in league history, and I don’t think they have ever done anything like that. You play the knowing that any play could be your last, so you need to go hard, but not take people out. I was with Gregg Williams in Buffalo, and he was tough, but I never heard him talk about money or taking guys out. I think a lot of it was taken out of context. They call Ndamakong Suh a dirty player, but he just plays hard. People might not like him, and I get that, but he would be someone that I would want on my team. He’s got people taking of him, but there’s worse things in life then a guy having family taking care of him. He wants to play an old-school style. Instead of being a gladiator sport, it’s like a ballet. Do you think the Redskins should change their name? Well, I think if it’s offending people, yes. If there’s a group of Native Americans offended by it, then yes. I used to watch the Redskins growing up, and I never put the two together. A lot of people do, and I get that. If it offends a group, then change it. Keep it as close as you can, figure out something, make it a lottery or something. If it’s an issue, then yeah, make it an animal. Just make it the Washington Snyders. I don’t think changing the name will bother any players. How much does the NFL help players after they’ve retired? It’s funny that you ask that, because on November 13, 2013, the NFLPA launched the Player’s Trust. It’s a vehicle to help players with their transition out of the league. When I say health, I mean brain and body scans, help with resumes, schools for other careers. Up until this year, there wasn’t much, and you had to jump through hoops to get to it. The NFL put $22 million into this fun to help the retired players. For guys that are 15+ years out of the league, the NFL Alumni has a study where they can scan your brain if you want it. They have a thing called maximized living, where it’s like a chiropractic and body balance type thing. You also have access to the career transition part of it. Now, the NFL does have something. Until then, there wasn’t much. I ended up coaching right afterwards, so I didn’t completely feel it. Before all this, it kind of just felt that once you were out of the league, you were out of sight and out of mind. How would you feel if you had an openly gay teammate? I’m from the South, my brother is a Minister. I live by God’s law, but would I care? No. Would I not like him? No. I probably wouldn’t go out of my way to hang out with him, but I still wouldn’t care. If guys are tripping on being called the N-word, then it could be an issue with someone being gay. You just have to have thick skin. If you find a player who has no problem and just wants to be him, then it’s fine. He’s got to be a great player, though, and if he helps us win, then I’m fine with it. If one of my boys turned out to be that way, I’m going to love him 100%, and I’d accept it. If a guy came out and then reported he was bullied, then you’d probably magnify what you’re seeing with the Dolphins 10 fold. If he were sensitive, or soft-hearted, then he wouldn’t make it. On top of what we learned in the interview, I was also pleased to learn that Sam Gash had applied for the Eastern Michigan University head football coaching job, so if you'd like to wish him luck with that, you can do so on Twitter.